This article is not complete yet! It will be updated with restoration description and photos when the game is finished. Even though I rotated a lot of older games (most were System 11) and found out that none of them had enough long-time replayability, I always kept my eyes and thoughts on Space Shuttle. I was first introduced to the game when I scrolled through the Williams games starting from 1980 to 1999, trying to find out which games might be of interest to me. 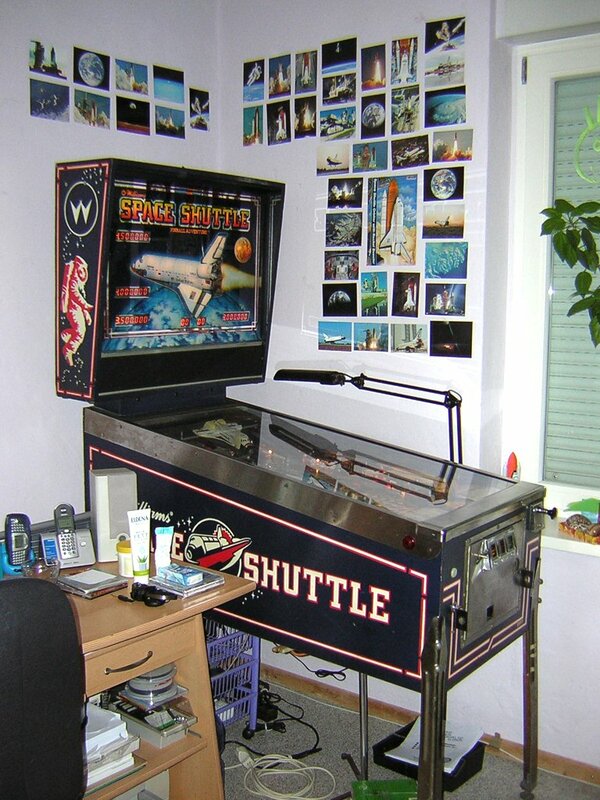 I was still a beginner and wanted to buy my second pinball machine after Arena had left, and since I found older machines appealing at the time because of their classic design and old-school gameplay, many games from the 80s caught my eye including the Shuttle. I was impressed by the layout of the playfield, classic yet moder-nized with features such as ramps and standup targets. The artwork and theme also fascinated me. 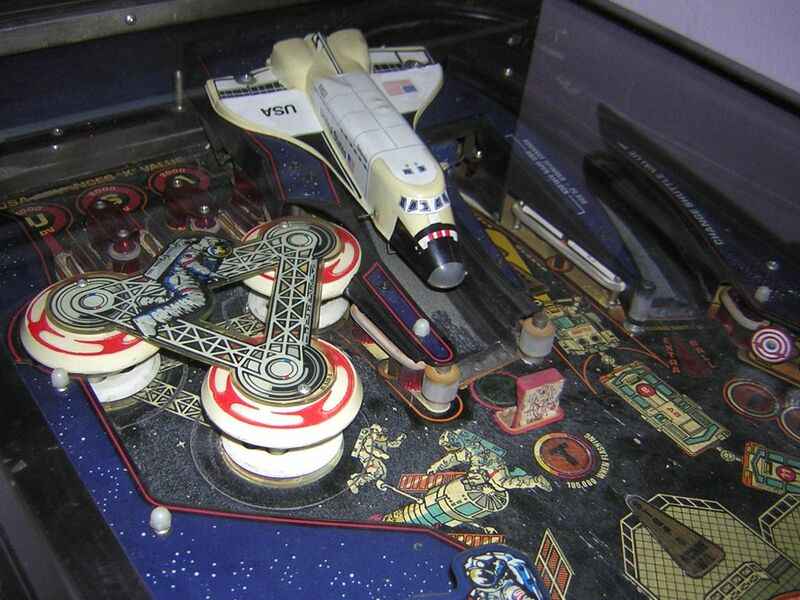 I am very interested in space exploration and the technology behind it, and the Space Shuttle with the triumphs and drama around it is a perfect theme for a loaded pinball game. Even though the name "Space Shuttle" sounds bland, the machine seemed to be a very fine piece which covers the technology, astronomy and drama very well. Still, when it came to the decision which machine to buy, I chose Space Station over Space Shuttle because I thought that it had more complex gameplay (which was true) and created an even better atmosphere of space (which was partly true), especially with its sound and soft visuals. Also, the game seemed to be more fun in the long run when I compared them both in Visual Pinball (which turned out to be false). When I sold Space Station again because it didn't live up to my expectations, I wanted to have a Shuttle instead, but there wasn't one available at that time and so I went on with other games. I was very excited to find a Shuttle on eBay quite a few times, and every time I bid on it, I thought I'd win the auction. 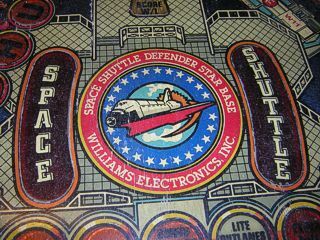 Two of these Shuttles even had mylar on the playfield which significantly distinguished them from unmylared machines. I lost all these auctions in the end, so I kept going with other games, finally dropping System 11 and moving on to WPC and DMD. And I still wanted that Shuttle, some-day. The game has such an atmosphere and replayability despite its simple gameplay, the rush you get when you play it, the speed of the ball and how powerfully it's kicked around, and the fact that this game needs true skill to reach highscores (since there aren't many rules, you are "forced" to play well and long) - all of that never ceased to amaze me when I played it in a very well done conversion in Visual Pinball during all that time I waited to get it. If I can play a pinball game in a virtual version for more than one year, is there any reason I shouldn't buy it? True, after the disaster with Xenon I found that not every classic game can be a success in my collection, but for some reason this was different. And now I have it, and I know it was worth the wait. The simulation is so close to the real machine, not just visually but also physically, that I felt right at home on my first game. It just plays damn right! If you get good at this game, it's a rush to play for a long time. I haven't managed to get anywhere near a highscore yet where I managed #1 on Visual Pinball, so there must be a difference in skill level, which is always good. The game is challenging over and over again and never bores me - and if it ever does, no problem, because I have three other complex and modern games standing on the opposite side. This was a funny story. Usually the guy who drives the pinball machine to my house and unloads it will also carry it into the flat with me. Not so this time! This man seemed to be in such a rush (notice that he arrived WAY too early even though his sheet said "not before 12:00") that he let me sign two papers and off he went, leaving me with a packaged and paletted Space Shuttle pinball game on the street. Well, since there was no way to carry it inside alone, I resorted to my friend Chris who luckily was at home and had time to drop by and help with the installation. Once the game was all set and ready, the first thing I was worried about was the transistor for the right bumper which was replaced by the previous owner, but he had informed me that he saw the new transistor getting hot when the machine was turned on, so he left it to me to find out what the cause was. When we turned the game on, it took ten seconds in attract mode until there was a small crackle accompanied by the smell of sulphor. It was clear that the transistor had burned out and the bumper wouldn't work, but the game booted up on the next power cycle and was playable from the start. Not only the bumper, but also the left sling-shot was dead, and many of the bonus matrix lamps were not working. At first I suspected the lamps or sockets to be the problem, but I found out later that all of these lamps were in one column in the lamp matrix and the problem was a transistor too. 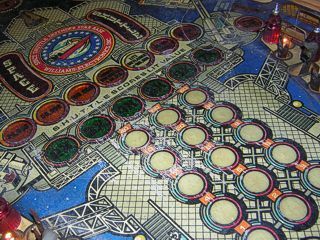 The game was also very dirty and since it never had mylar applied except for slingshot moons, there was some noticeable wear in the matrix area as well as in the center playfield. Other Shuttles are worn down to the wood at much bigger spots, though. Fixing this wear or at least doing damage control will certainly be possible even though it will take time. As I said above, the theme is perfectly captured in this machine. The Space Shuttle is prominently featured on the backglass and has a very nice strobing lamp effect behind the thruster exhaust fire! 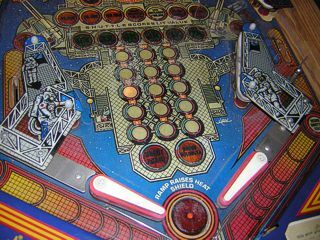 The playfield features the open shuttle in the center, interestingly with cannons armed to the sides (pointing at the ball locks), and the shuttle is called "Defender" which seems to imply that this is a fantasy scenario where a Space Shuttle is used as a defensive weapons array... Apart from that inaccuracy, the artwork also features astronauts hovering in space and maintaining a telescope (an astronaut wrote that it's supposed to be Hubble, but this telescope was not yet in orbit when the game was designed). The plastics are coloured in blue and have stars on them to let the GI light through, there is a shuttle spinner that shows the resting shuttle on the front and the thrusting shuttle on the back side, the bumpers are white with red frames on the caps and have a triangular plastic on top that looks like a set of iron beams holding the bumpers together - a nice touch! And then there is of course the plastic model of a Space Shuttle which was the first "toy" to be used in any pinball machine. In general, Space Shuttle is said to be the game that saved Williams from closing down their pinball branch and pulsed new life into the genre next to all the arcade video games which stole players from the pinball empire. The audio side of things creates a "melodic" background sound (which is basically a wave of sound pulses that go up and down) mixed with synthesized explosions, rocket boosters and various artificial scoring effects. The key to coolness is the speech: the sentences are made of nine words (I believe) which are combined in certain ways to shape instructions or infor-mative phrases, such as "ready pilot one", "airlock open" or "three, two, one, liftoff". Also, there is a really freaky scream sound that occurs in various random cases and really enhances drama in the game! 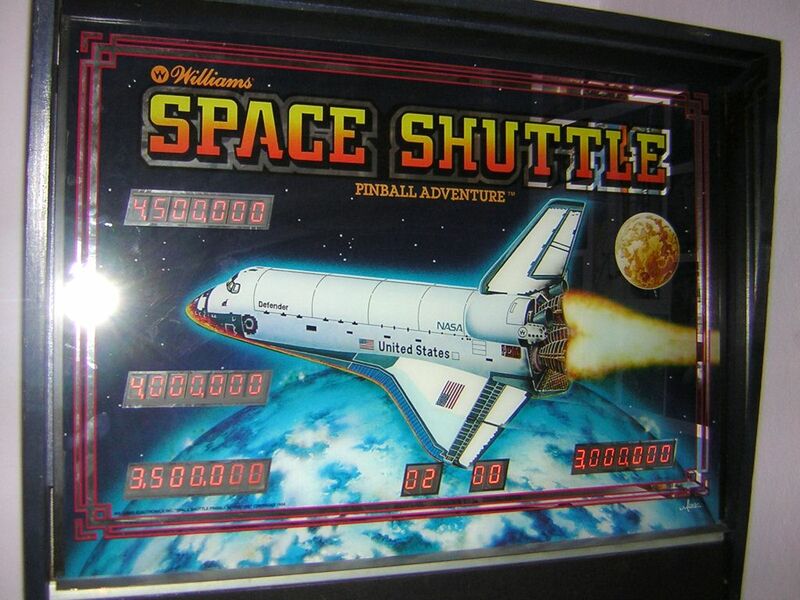 Space Shuttle's gameplay is fairly simple as is normal with EE games, but it's a lot more fun than earlier machines because it is faster, more loaded and multiball is a rush even on such an old machine! There are two "goals" apart from the usual goodness like highscores, extra balls and specials: the timed drop target in front of the center ramp must be knocked down to access the ramp, which starts Stop & Score, rolling numbers from 10,000 to 99,999 on the displays. If within the time limit of the target the ramp is made, it scores the currently displayed value. Also, every time the ramp is made, the popup post between the flippers (the "heat shield") is raised for a few seconds so that the ball can't easily drain through the center. 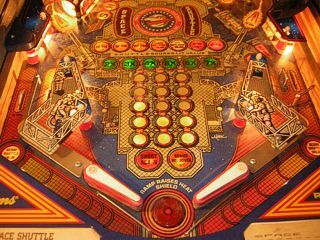 The second goal is to maximize the ramp's scoring power in multiball, which is easily started by locking one or two balls in the two locks on both sides, then hitting the ramp to release them. 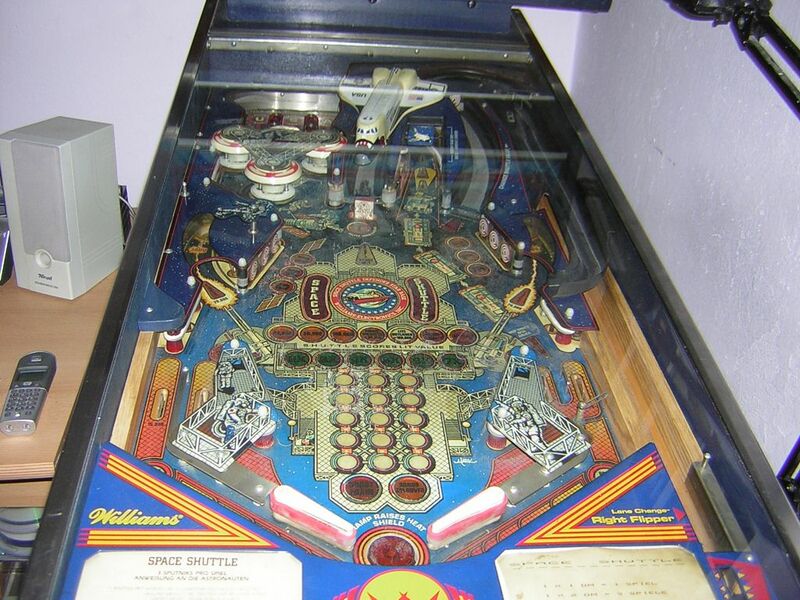 Once multiball is started, the background sound will change to a computer-styled mix of beeps, the balls are released one by one, the popup post is raised for an extended time so balls can't get easily lost on multiball start, and the ramp is permanently open and lit for Stop & Score. Other scoring opportunities are the bonus multiplier which can easily be raised in the bumper lanes, the S-H-U-T-T-L-E spellout on the standup targets and the ramp drop target which will score a randomly predefined award, the spinner which can raise in value and the bank of three drop targets in the spinner lane which aren't easy to hit, but if made, they raise the spinner value and open the airlock, a ball saving gate on the right outlane. It's also worth noting that Space Shuttle has a ringing dinging BELL built into the cabinet which serves as a replacement for the knocker, but it also informs you of ramp shots on Stop & Score as well as S-H-U-T-T-L-E spellout prizes, and it goes really wild when you score a special or an extra ball! It's really loud at that point and you shouldn't be playing the game at midnight unless you're alone! As dirty as the game was, it played fast and snappy, even the old flippers (one diode on the coil and no filter capacitor = big sparks at the EOS switch) still had a lot of power. I have been playing lots of games on the machine in this state and it was so much fun that I didn't think a lot about starting with restoration, but instead I wanted to get the game to run with all the bells and whistles it had (okay, the bell already worked! ), so I started looking at the lamp matrix problem and found out that the manual doesn't state which transistor is respon-sible for which lamp matrix row and column! I removed the MPU board to test all the transistors and got zero readings for the transistors I suspected to be lamp matrix controllers, and I later found out that I was testing the wrong way since these transistors are TIP41s and no TIP120s like the ones used for solenoids. At any rate, when I installed the board again and turned the machine on, the whole bonus lamp matrix lit up! Obviously the transistor for the column wasn't broken after all, but there was either a cold solder joint or a cracked solder pad which I had "corrected" when I moved the transistors around for testing. 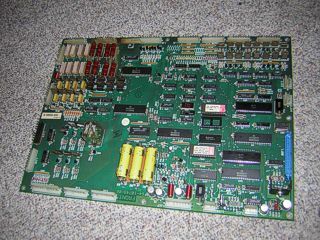 Next time I remove the board for further repair, I will resolder all the lamp transistors to fix this problem. Before I went on with the bumper and slingshot, I had to take a look at the power supply board because the machine sometimes wouldn't boot up when turned on. It just lit up the GI and not even the displays came online. 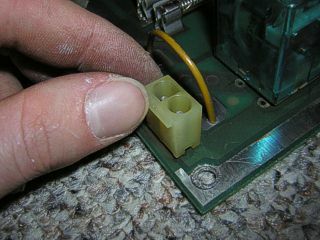 The problem was simple: a connector on the board wasn't tight at all, in fact it sat so loosely that I wondered how it could even run current at all! Resoldering both pads had the connector sit tight again and the machine booted up again. Suddenly, the left standup switch also worked! 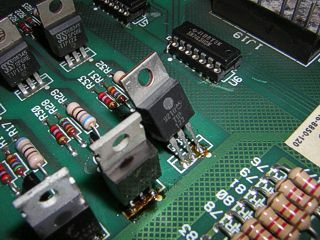 Unlike the lamp transistors, the solenoid transistors are listed in the manual and could easily be found on the board. I tested them and found out that the whole row of three transistors responsible for the right bumper and left sling-shot were burned out (the first of the three is not used for the game)! Since the new transistor had burned out in a matter of seconds in attract mode, and I had not seen the bumper coil energizing, I wasn't sure what the problem was. To get closer to a clue, I removed the predriver and the transistor for the bumper and replaced both with new components although the new pre-driver gave me testing results that were unlike the others, and I wasn't sure whether it was the right component for this game. When I turned the game on with the board reinstalled, the transistor got pretty hot and there was a humming noise coming from the speakers. Again, I was sure that the bumper solenoid did not energize and I wondered why the transistor got hot. I had tested the coil diode and the coil itself to make sure that there was no power feedback from the coil to the transistor that might destroy it. 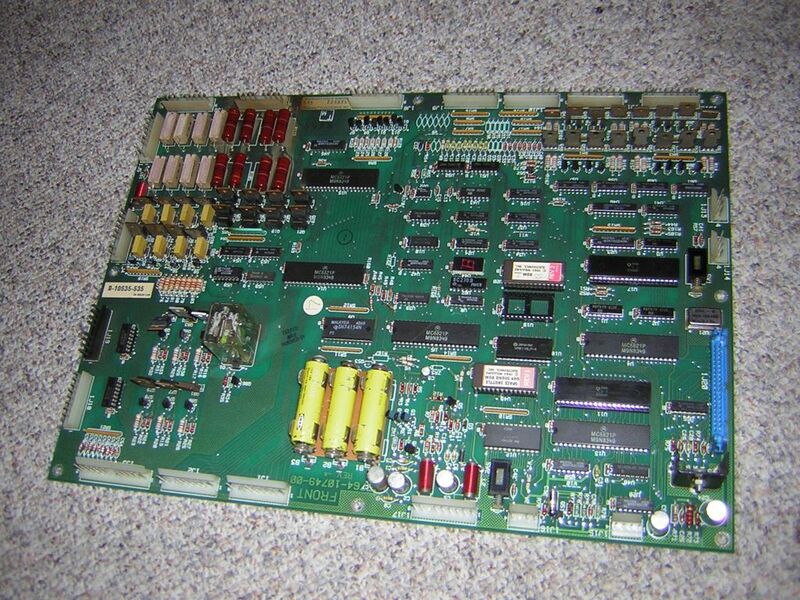 So I removed the board again and kept reading along Marvin3m's System 3-7 pinball repair guide that helped a great deal with the diagnosis, even though Space Shuttle is a System 9 game. From the guide, the next component I suspected were the two 7402 chips that sat left next to the transistor rows. Could the chip for the broken row be faulty and could this have caused all three transistors to fail? I removed the chip from the socket (somebody obviously had installed sockets for these chips previously, luckily for me) and tested it, and it failed! The other chip was intact, and since I had no replacement, I exchanged the two chips to see what happened. I wanted to test whether the intact chip would still make the bumper's transistor run hot or not! Naturally, when the game was turned on, the faulty chip made the two other bumpers energize because it let the grounding signal through the intact transistors. I couldn't keep the game on for long in this state, but I noticed that the right bumper's transistor didn't warm up. It was hard to determine whether this was because of the new chip or not since the game was only on for a few seconds. At least I knew that the broken chip might have burned out the three transistors in the upper row at one point in time, and I concluded that replacing the bumper's predriver and transistor should have energized the bumper just like it had happened with the other bumpers... but I couldn't remember seeing the bumper energized with the new transistor before! Puzzled, I exchanged the chips back to the old state, reinstalled the board and turned the machine on. NOW the right bumper energized, but I didn't notice it (since I was confident it wouldn't) until one minute was over! 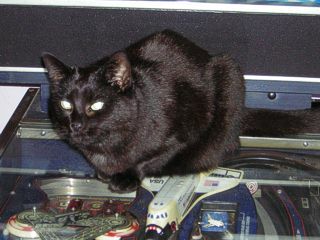 That obviously blew the new transistor and I heard some distinct crackle coming from under the playfield. Surprisingly the bumper coil looked and tested good after this stress procedure, so I was lucky this time. At least I could conclude that the chip WAS the cause of the broken transistor row and the fact that every new transistor was burned out quickly when the machine was turned on - however, whether or not the solenoid(s) energized every time I can't say for sure. It did happen the third time, so I will buy some new chips and see whether these fix the problem! In the coming weeks, my Space Shuttle will receive an overhaul of the play-field. This will include complete cleaning of all parts on top of and underneath it, since lamps and lamp inserts need to be cleaned and some old components like flippers and switches actually need to be replaced if I want the best performance. After this I will try to touch up the worn areas which will be easy in the black zones of the playfield, but very difficult on the center (including the Space Shuttle Defender Star Base logo and the bonus lamp matrix). I can imagine that some wear will remain after the touchup is complete and I will try and seal this wear with lacquer coating. 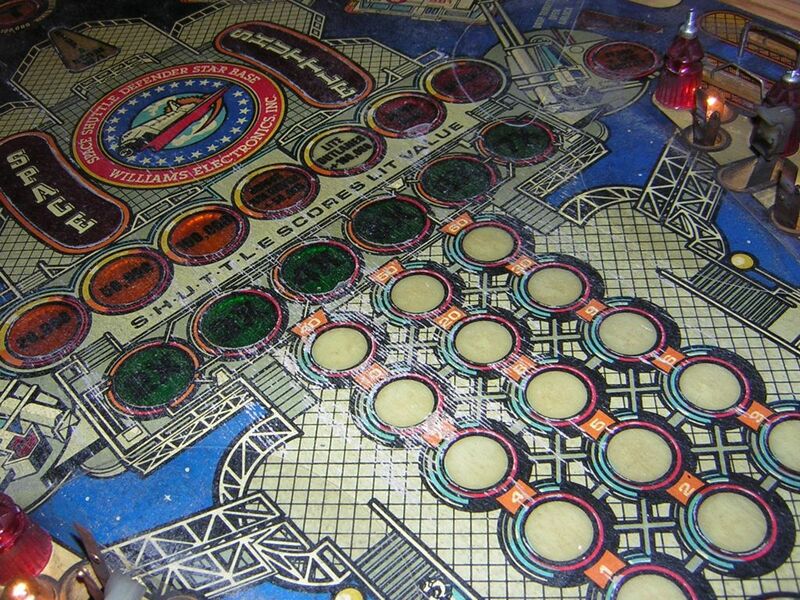 I have no intention of clearcoating the whole playfield since that would be a little overkill for an imperfectly restored work like this, plus it has all sorts of damages to the existing coat that would remain underneath (you can't kill these crowfeet and lamp insert coat rips without removing the paint). I can only protect my retouched work with local coat spots and wax the whole playfield after it's done. Maybe one day I'll come across a mildly used or even NOS playfield (I've seen one on eBay!) and replace the current playfield with it. 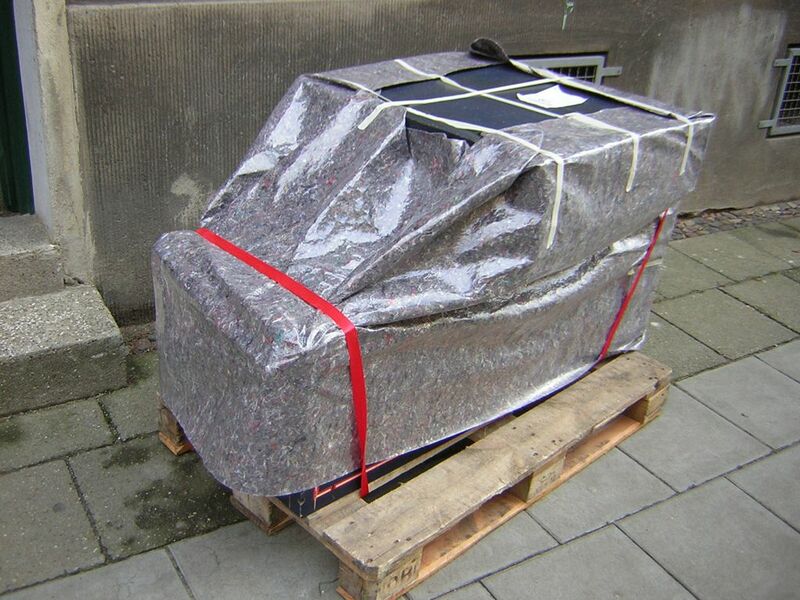 Until then, it's simply an old machine and a few wear spots and scratches are part of the experience! The cabinet and backbox as well as the backglass are exceptionally good, though. The backglass has virtually NO bubbled or scratched paint, only the bottom frame flakes the paint a tiny bit. Technically there is still an unresolved mystery to spontaneous resets that can occur in attract mode or during gameplay. Since it's usually a bridge rectifier that causes resets, I exchanged the two bridges inside the backbox, but I later found out that those are used for the lamp and solenoid matrix and thus exchanging them didn't help the resets (it was still a good idea since they looked old enough). 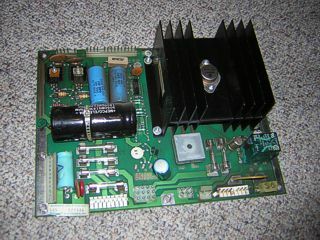 It might still be the bridge on the power supply board, but I can't exchange that one easily because it has broad legs. 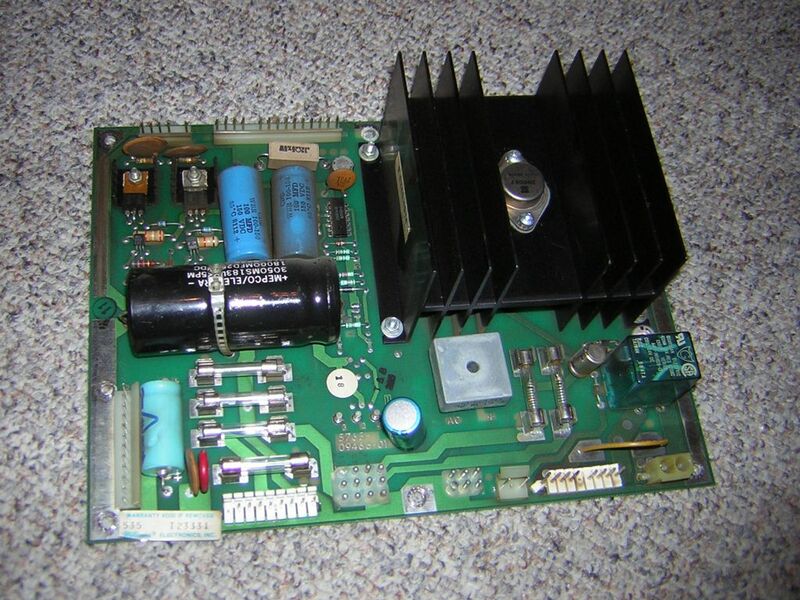 Plus, Marvin3m writes in his guide that diodes and filter capacitors can be a much bigger problem with resets in this system generation, so I might take a while to find out what causes them. 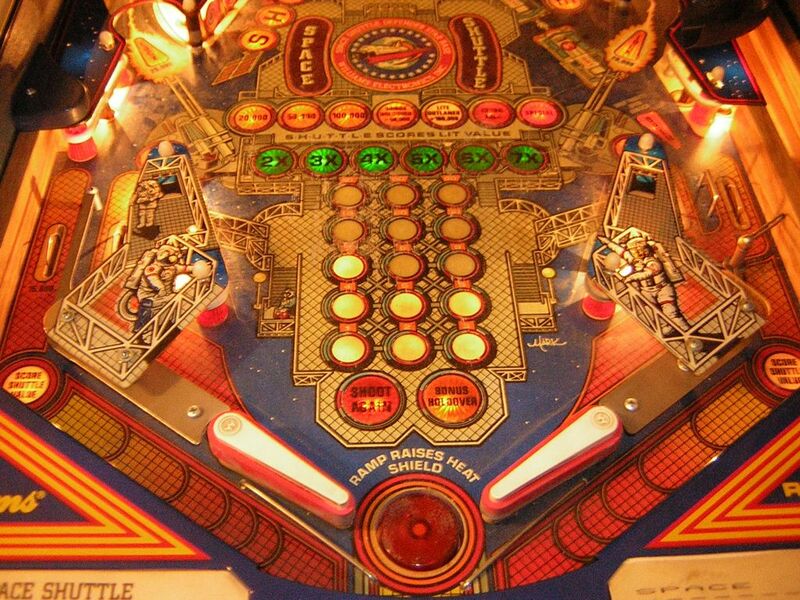 The Internet Pinball Database has interesting photos and info on this nice game. 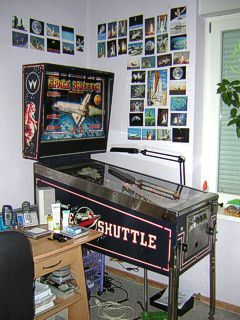 Playing Space Shuttle on Visual Pinball is a ride with Emkaah's excellent prerendered conversion for your PC! Get it from VPForums. © 2006 Maximilian Schulz - Williams, Bally, Gottlieb and all other names, all pinball games and software mentioned on this site are trademarks of their respective owners.